Unfortunately this gig will be the last ever Underflow gig and true to form we have managed to book the same night as the European Cup final and Happy Mondays (playing Music Hall). But never mind thats enough of advertising our opposition. Quite rightly taking their place at the top of the Best of Underflow bill, Popup are believed by many to be Scotlands finest unsigned band and its surely only a matter of time before they make it big. Just back from a hugely successful tour of Texas, and off the back of fantastic single release Chinese burn this band are quite simply Scottish Indie pop at its finest and are a must see! "Popup are quickly becoming THE live act to catch in Scotland" - Is This Music? Back for their third Underflow appearance, Kid Canaveral just get better and better. Having constant air play by the likes of Jim Gellatly and Vic Galloway and even having their video for recent single Smash Hits featured on the BBCs music show Kid Canaveral are really going places. Local Anti-folk favourites, the holy folks are awesome and the most entertaining live act you are likely to see. A band so good they have even been head hunted to do a tour of New York. More acts to be confirmed. Hope you can make it (after the footy), and cheers to all the bands that have played Underflow in the past. what does will the bands be kicking off calum do you know? can't it go really late to accommodate the fitba? anyway, i swear to god Popup are absolutely amazing. i love them. Right i've been doing my sums. football kick off is 7.45 (i think) so as long as there is no extra time finishes at 9.30. So we'll aim for Holy Folks at 10.00, Kid Canaveral 11.00 and Popup at 12.00 (ish) that way giving every one time to get back to catch the magic of Holy Folks. There should also be a at least one act/band before that though (TBC). c'mon where are all the smelly indie pop kids??? this is gonna be an amazing show!!! 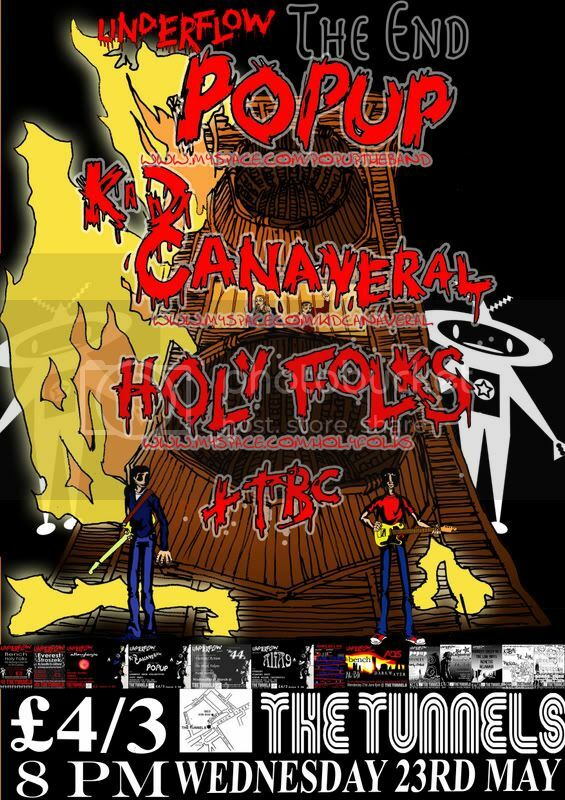 cant wait t'see/play with Kid Canaveral & Popup - both very good bands! we've played with them in the past - great guys and girl! Finish my exams on the 23rd, will come along to catch Holy Folks for the first time. we intend to go out in a bang. At the end of the show Callum and I will be sacrificed in a Giant sixed wicker recreation of the Underflow Logo. All bands who have ever played for us are invited to bring their own fire. Disclaimer: Fraser Denholm, Callum Russel, Underflow or The Tunnels in no way condone pagan arson in any way. so sad underflow is ending - at least its a good line up to send Fraser and Callum off with a bang (after bang after bang after bang...) some of my favourite local gigs have been underflow ones! Allie Ambient has been confirmed as support. To celebrate getting rid of us Jim is putting on drink promos on lager, vodka and Jack. For those wanting to stay Underflow djs will be on til 2am. Who's coming down to witness the end of Underflow? And see some pretty cool bands? Cheers to everyone who came down, and cheers to everyone whos ever been to or ever played at Underflows in the past. We've had a great time over the last couple of years, seen loads of great gigs and made the gigs that we wanted to happen happen. Anyway, should be some videos of last night available soon if anyones interested. ALso, my poster making skills are now available as I no longer have an outlet, anyone interested PM me.